Getting the timing, the intensity of the heat and even the amount of water for a cup of rice can be a daunting prospect when it comes to cooking rice armed with a stove and pot – making rice cookers an invariable, convenient staple in our kitchens. We love these nifty little devices that let us whip up the perfect batch of rice – and other grains, legumes, soups, and even stews and cakes – every single time. But which rice cookers are worth the investment? At the cheaper end of the scale one finds plastic or aluminum ones, but these generally don’t offer great wear, can be a headache to clean up and pose some serious health risks – which is why we prefer stainless steel. Non-sticking, highly durable and built to last, here are our picks for the best rice cookers with stainless steel bowls you might want to include in your kitchen. Dishing up the perfect serving of rice is a simple matter of flicking the switch to “Cook” with this rice cooker – which also comes with a stainless steel vegetable steamer to let you whip up healthy, nutritious sides along with your rice for a complete meal. The cooker has an 8-cup capacity (for uncooked rice), with a measuring cup included, and is ideal also for effortlessly cooking lentils, quinoa and other whole grains. Once your rice is done cooking and the cooker can no longer detect any moisture in your food, the switch flicks up from “Cook” to “Warm” mode and lets you keep your meal heated up right until you’re ready to eat. The non-stick surfaces of the cooker make it easy to clean up, the steel bowl and tempered glass lid both removable and dishwasher-friendly. If you’re afraid of burning or browning your rice, especially if you’re cooking one to two cups at a go, you can simply unplug the cooker to deactivate the “Warm” function once your rice is ready. Free of Teflon or plastics likely to do you more harm than good, this surgical-grade stainless steel rice cooker can whip up 6 cups worth of cooked rice in one go, suitable for making meals for the family or for yourself. The no-fuss cooker features a “Cook” mode, which switches to “Warm” once the rice is done to keep your food ready to serve whenever you wish. 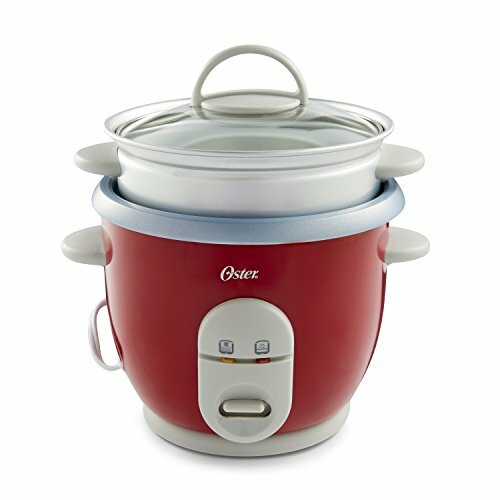 With a rice paddle and measuring cup included, the cooker features a removable stainless steel bowl with a mirror finish and a glass lid, a miniature vent affixed to it to let some of the steam building up escape. This is a great budget option not just for cooking the perfect pot of rice every time, but also for convenient one-pot dishes, stews and legumes. 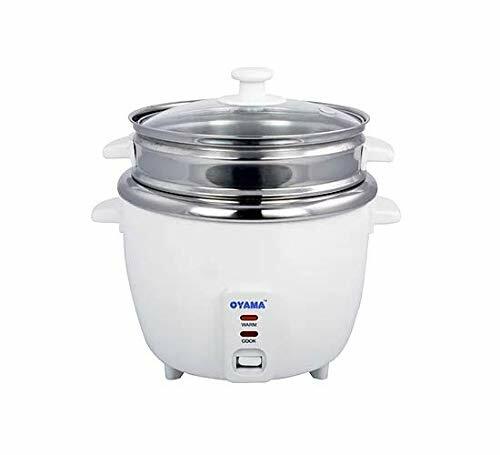 With a steamer tray included that you can use while you cook your rice, this cooker boasts huge capacity, yielding up to 16 cups of cooked rice in one session, making this the right choice when you’re cooking for a large group. Since the cooker does not feature an automatic shut-off system and will simply switch to the “Warm” mode once the rice is done cooking, you’ll need to be a little mindful to unplug the cooker if you don’t intend to serve it up soon, since it might burn or brown otherwise. Both the rice bowl – which can also be used for cooking soups and stews – and the steamer tray are made of top-grade stainless steel, easy to clean up after use. The glass lid comes with a little vent to let steam out, but if you find that it starts spilling out water, lay a dry cloth over it – this easy hack will do away with any unfortunate splatters you’d have to clean up otherwise. A larger version of our Star Budget Pick, this version is ideal when you’re cooking in bulk or prepping a meal for a large group of people, with its capacity for yielding up to 14 cups of cooked rice in one session. With a rice paddle and measuring cup included, the stainless steel construction of the cooker makes for perfectly safe cooking compared to plastics or Teflon. The cooker comes with the familiar “Cook” and “Warm” modes, with a little sound notification to signal that your rice is done. The steel bowl and glass lid are both removable and easy to wash down by hand or in a dishwasher, the lid coming with a little vent to let steam escape and maintain the right heat to let your rice and other dishes cook properly. If you find the vent spits out water when your rice is in full boil, place a dry cloth or wash towel over it – this stops the sputtering effectively and makes the process mess-free. Teflon is a risky material to do any kind of heating in – the fumes it releases can be fatal for birds, and pretty harmful for humans, too. Stainless steel is the healthier, safer option, with rice cookers offering removable stainless steel bowls you can take out, wash up and replace to make rice or even to double as a cooking pot as you throw together a quick one-pot dish. These also tend to be non-sticking, so you won’t have to spend an inordinate amount of time scraping food stuck to the sides of the cooker once you’re done using it. Since one of the central advantages of seeking out a rice cooker is convenience, we recommend one that does as much of the job for you as it can without the constant need for monitoring and inspection, so you can tend to other things while your rice cooks. Rice cookers which feature an in-built mechanism which switches the mode from “Cook” to “Warm” are favored, since they detect when the last of the moisture in the pot’s contents have disappeared and help avoid accidentally overcooking or burning your food. Nonetheless, when it comes to rice cookers with the “Warm” option, a little burnt rice or food sticking to the bottom of the bowl might be unavoidable if you were to leave the cooker on for too long. Look out for cookers that signal when the rice is done cooking, preferably with an audible cue, so you can simply unplug the cooker without risking any browning or burning. Another tip is to thinly slick up the bowl with a little oil before you start making rice – this prevents the rice from sticking to the sides and makes washing up much easier. What If You Don’t Need a Stainless Steel Bowl? There are some amazing rice cookers on the market with non-stick bowls as well. Rice cookers have skyrocketed in popularity over the years, evolving into one of those must-have items in your kitchen. As many people cook rice on a daily basis, the hit and miss approach to preparing it on a stove top can be easily remedied by employing one of these machines to do the job more effectively. 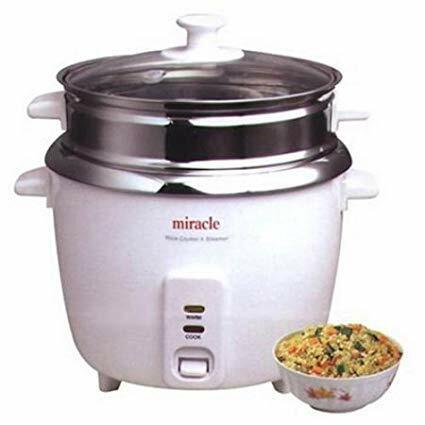 Indeed, rice cookers take the guesswork out of the process, delivering perfectly-made rice each and every time in a set it and forget it manner. But since there are many models at various price points to choose from, knowing which features to target can be difficult. In this article, we’ll take a look at some of the highest rated rice cookers and determine which ones make the best choices to add to your kitchen arsenal. 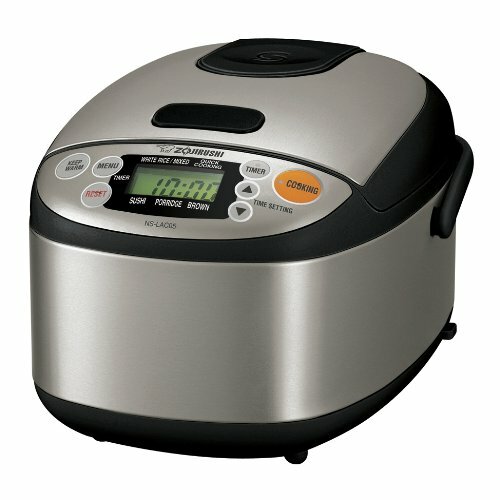 Although the Zojirushi NS-LAC05XA Micom Rice Cooker and Warmer is relatively expensive, the higher price tag is there for a reason. Incorporating a host of features into its compact size, the Zojirushi represents the ultimate in rice cooking technology. While many lower-priced cookers can tend to either under-cook the rice or, worse, allow the water to boil away and burn it, Zojirushi’s entry offers what it calls “fuzzy logic” sensing to ensure that any variety of rice is cooked perfectly every time. To that end, an on-board processor constantly adjusts the cooking temperature to optimal levels, starting with low-temperature levels and gradually increasing them for maximum water absorbency. Attractively styled and with a small counter top profile, this cooker features a durable evenly-heated insert that not only ensures that rice doesn’t clump and stick to it, but is easy to clean and is dishwasher safe. The interface is intuitive and easy to use, offering presets for white or mixed, sushi or brown rice varieties, as well as porridge. A quick cooking option adds additional functionality, allowing you to enjoy rice faster than via conventional stove-top cooking means. Within those settings, it will handle any type of rice you would want to cook, and it handles porridge with ease. And if your rice is ready before the rest of your meal, an automatic warmer will keep it ready to eat until you are. The unit comes with accessories including a rice measuring cup, spatula, and a spatula holder. Despite the higher price, the Zojirushi Micom rice cooker offers premium rice cooking functionality and would be a welcome addition to any busy kitchen. One of the highest rated rice cookers available at a budget price is the Oster 4722 6-Cup Rice Cooker. While lacking many features that come standard on its higher-priced contemporaries, the unit is a serviceable cooker that will get the job done, albeit in more of a no-frills fashion. Featuring a durable cooking insert as well as a steamer tray, the Oster lets you steam your favorite foods while the rice is prepared. Although it purports to be nonstick, rice has a tendency to stick at the bottom during preparation, and it usually needs to be soaked a little to remove baked-on rice, something you’d never have to worry about with the Zojirushi. As well, it lacks a timer for fine-tuning your cooking, offering up a simple on/off cooking function that automatically switches to a warming setting once the cooking cycle is done. Additional features include a rice measuring cup and a rice paddle. Despite its shortcomings, and as long as you don’t mind a little manual intervention in the form of occasionally stirring the rice while it’s cooking, the Oster 4722 makes for a good choice based on the price as well as its solid construction and durability. 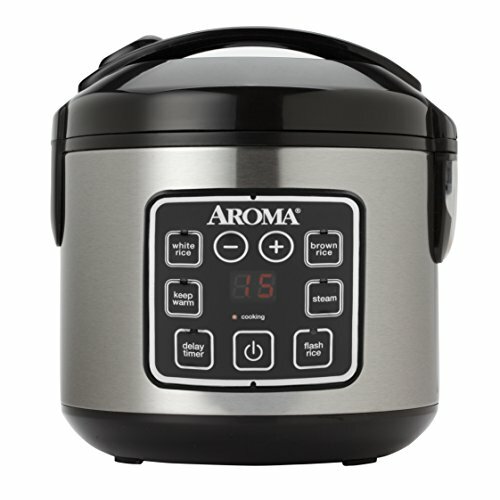 Small, durable and weighing only 4.2 pounds, the Aroma Houseware’s ARC-914SBD Digital Cool-Touch Rice Cooker is a hybrid cooker/steamer that fits well into almost any budget. The LCD interface is easy to use and comes preprogrammed with variable temperature settings for steam, white and brown rice, and features a delay timer that allows you to prepare your rice up to 15 hours in advance. The Aroma takes a little bit longer to cook rice – especially brown rice – than by traditional stove-top methods, however, this is purported to be a slow-cooking feature that results in better rice. The stainless-steel insert is sturdy and coated with non-stick materials, and allows you to steam vegetables while the rice is cooking. 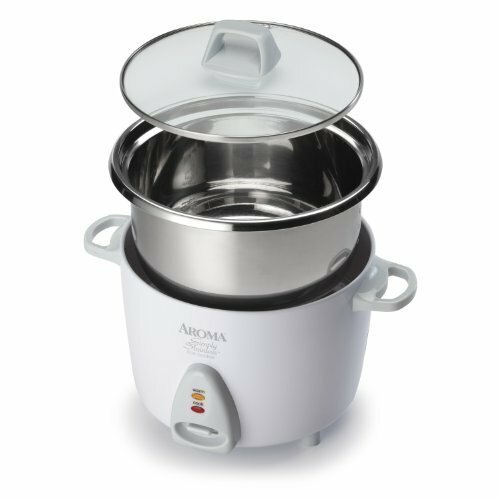 It also offers a decent capacity, letting you prepare up to 8 cups of cooked rice, perfect for a large gathering. And the cooking process itself is dynamic, with an on-board sensor that automatically adjusts cooking temperature to yield an optimal result. While it’s constructed of sturdy stainless steel, some users have complained of durability issues, with several preset cycles malfunctioning after a period of time, although this should be covered by the 1-year manufacturer’s warranty. 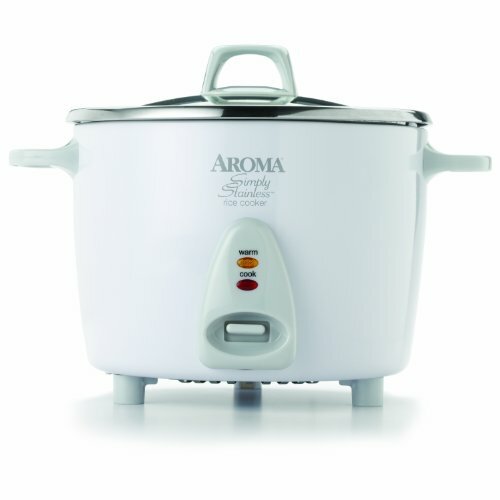 Overall, Aroma Houseware’s rice cooker is a budget-friendly product that will get the job done simply and effectively. 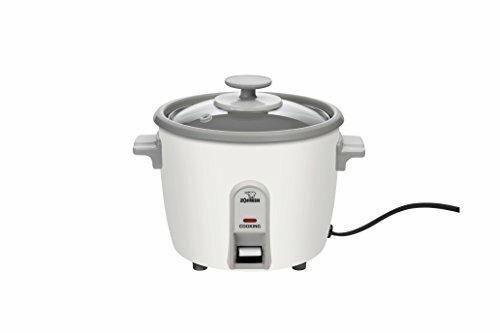 Like its more expensive sibling, the Zojirushi NHS-06 3-Cup Rice Cooker is a durable cooker that will yield superior results. Unlike the NS-LAC05XA model, however, this unit is a considerably pared-down version and lacks many of the features of similarly-priced products. Its mid-range price, though, buys you durability and dependability, owing to its solid construction and ease of use. The interface couldn’t be simpler, offering on/off capability and the ability to switch to a warming function when the cooking cycle is complete. A stainless-steel insert ensures that the rice won’t stick, and the unit keeps cool to the touch while in use and features a clear lid with a knob that won’t burn your fingers. It cooks all varieties of rice fairly well, as long as you stick to the preparation instructions on the rice package itself instead of those provided by the product manufacturer. The yield is 3 cups of rice (uncooked), a decent amount to be sure, and it also steams vegetables while in the cooking process. So while it lacks the bells and whistles of higher-priced models, the Zojirushi NHS-06 is still a versatile and dependable product that can be justifiably listed among the highest rated rice cookers out there.